One of the UK's biggest online bodybuilding supplements, protein and fitness snack stores. Spend £100 And Get FREE Next Day Delivery! Spend £49 or more and get free delivery charge! Pandy Protein SWEETS from JUST £2.29! New customers on Bodybuilding Warehouse can get 30% off their first order! Expires on July 31st 2018	New customers only. Get 20% off the whole Warrior range at Bodybuilding Warehouse! Expires on August 31st 2018	Offer ends August 31st 23:59. Get a free Bodybuilding Warehouse Protein Shaker on every order over £50. Save Now! Expires on August 31st 2018	Only on orders over Â£50. Ends 31st August 23:59. 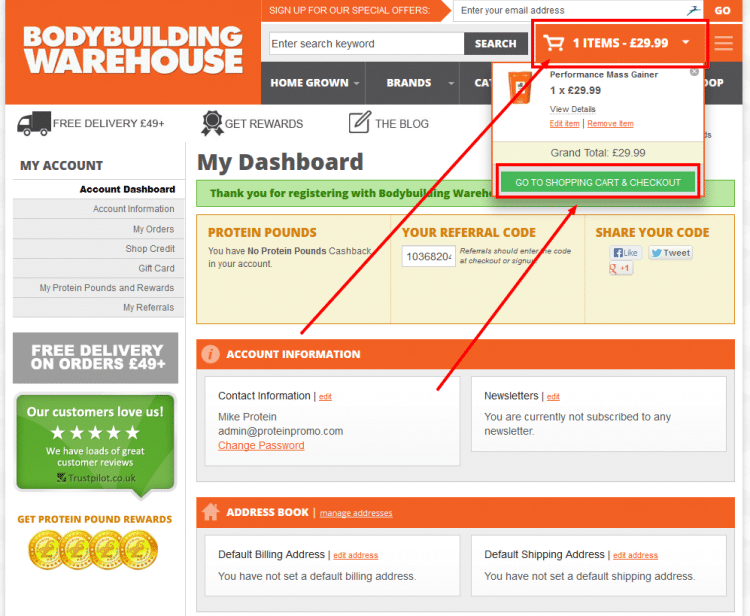 Finding and using a voucher code for BodyBuilding Warehouse is pretty straight forward. Follow these quick instructions and you'll have your money savings applied in no time. Browse the discounts we have listed above. Click one of the 'Click Here To Claim' buttons when you've found one you want. If it's a promo code, it'll appear in a blue box (close to the click here button). Copy it, or make a note of it. Shop for the items you wish to purchase with Bodybuilding Warehouse. Once done, click the shopping trolley icon in the top right corner. Proceed to basket/checkout. 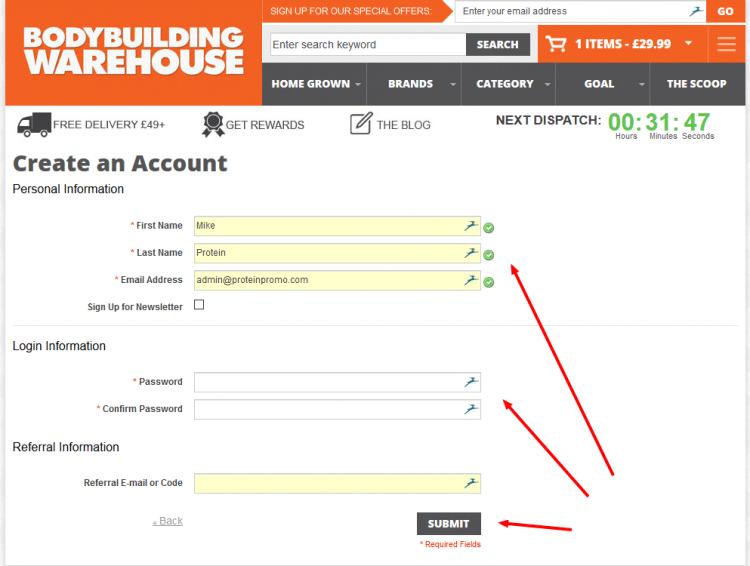 As shown in the screenshot, click the register link. If you've already got an account, login. If not, click the 'REGISTER' button. Registration is literally your name, a password and email. Fill out the form. Ignore the referral code box and click register. 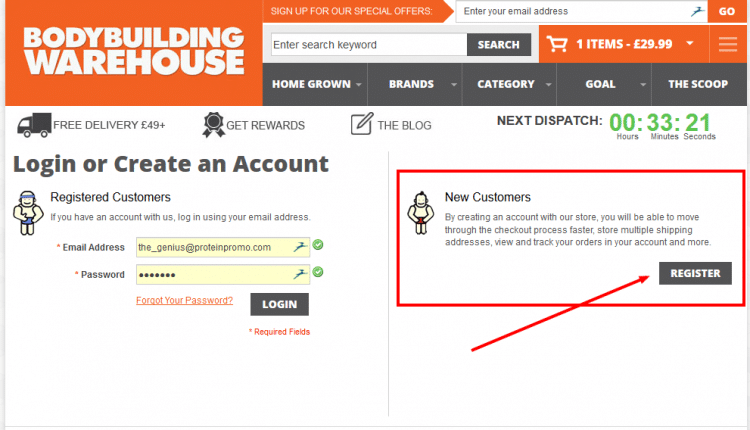 Click the shopping cart icon in the top-right corner and click the green 'GO TO SHOPPING CART & CHECKOUT 'button. 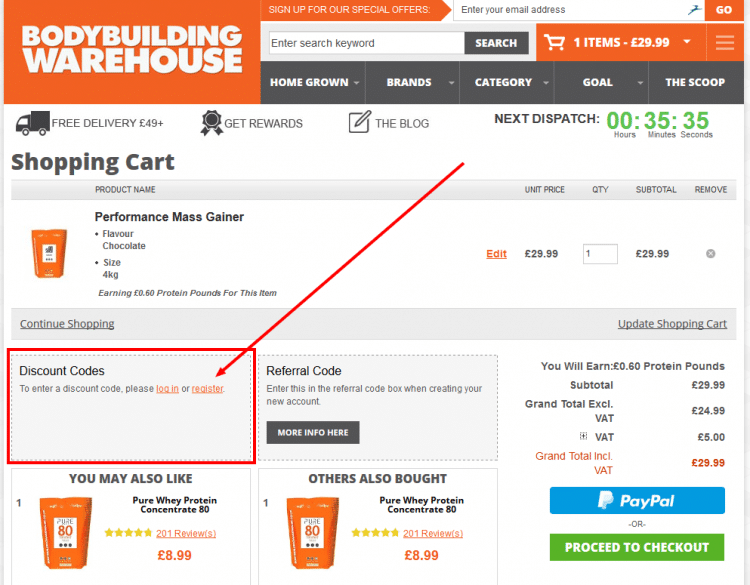 Paste or type in your voucher code that we provided you with earlier on (number one of these instructions). Click the grey 'APPLY VOUCHER' button. The page will reload with a success message in green. Your discount will be applied and shown down by the total. If your gym friends are looking to get cheaper protein, equipment, supplements or anything fitness related, make sure you tell them about Protein Promo - so they can benefit from saving money on their shopping too. Just as you like to be pumped about your body building and fitness you are going to be pumped when you first visit the Body Building Warehouse website. Time is no doubt important to you, and you want to see what is available to you that will enhance your overall fitness, and this is something that is easily done when visiting this site. After taking a bit of time to experience the home page you will really want to delve into what else is taking place here. A good place to start is with the Home Grown section. You will immediately be presented with some easy to read selections that will take you to your specific interests. If you have been into the fitness scene for awhile then no doubt you are familiar with some of the major brands. It can often be a hassle trying to track these down. For Vitamins and supplement deals, we recommend Zipvit. When it comes to bulk buying protein from a well trusted UK company though, BodyBuilding Warehouse comes up top. Or, it may be that you are interested in purchasing a few major brand products which is where BodyBuilding UK comes in handy. This can be a real challenge when you have to go to several different places to satisfy your needs. This is not the case when you are here at the Body Building Warehouse because they make sure that you have access to all the major brands that appeal to you. Sometimes it can be quite a challenge trying to determine if a supplement is going to meet your specific needs just by looking at the name of it. 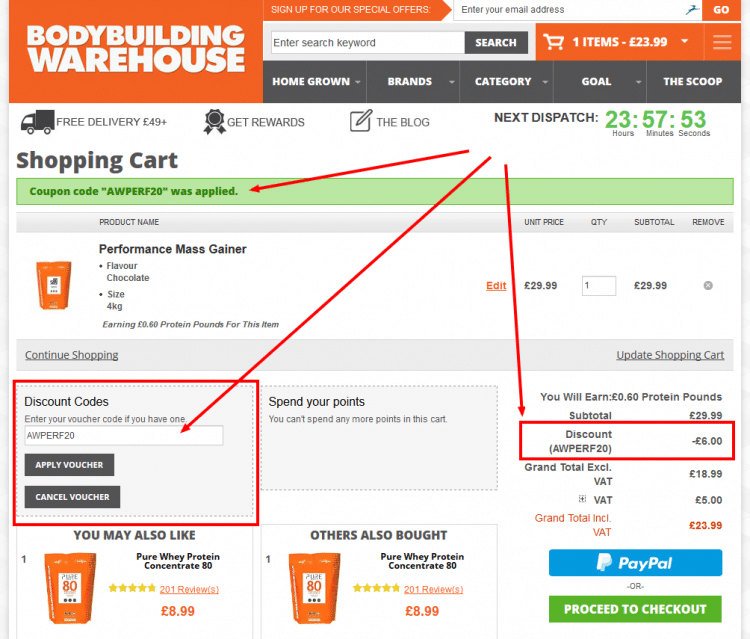 To remove this confusion here at the Body Building Warehouse you can shop by category, just as you can with other sites like LA Muscle and on the myprotein deals website. For example, if you are interested in some fat burning products then just click on that category and you will find a great selection where you can do some quick and easy comparisons to help you make your choices. No second guessing when you are shopping at the Body Building Warehouse. There are those that have a specific goal in mind and they want to know what supplements and resources can assist them with their success. This is a simple process as you can go to the Goal section on the site and everything you possibly want or need is just a matter of a click on your mouse. While it is great to be able to take advantage of such a great shopping portal as this, you still need more. Of course you want to be kept up to date with what is happening in the fitness world. You also want to know the opinion of the experts. No need to leave the Body Building Warehouse for any of this. Just visit the “Scoop” section. Be prepared to stay awhile because there is a lot of exciting and informative information for you to check out here. There is the blog along with some important articles with some “need to know” information, plus, some great videos that you will find helpful. What Makes Body Building Warehouse Different? Aside from all that we have just mentioned it is important for you to know who is behind the scenes at this great supplement provider. As a fitness buff there is no doubt you like to hear stores about success. If so, then you are going to be impressed with the story of the Body Building Warehouse. They started back in 2008 in a very humble way with a simple line of products and a basic web presence. Now eight years later they have established themselves as one of the largest and well received supplement retailers in the UK. This company now has a huge warehouse to service their customers yet don’t forget how they got here. They give the credit to those who set the path of success for them which is their clients. While you may have become impressed with the quality that this Company offers you are going to be even more pleased to know that their warehouse is not just merely for storing popular supplement brand products. The Body Building Warehouse actually manufacturers many of their own supplements and related products. You just can’t get any more hands on than that! With the Body Building Warehouse it is all about personalization which is what true fitness is really all about. The company can only be successful with this mandate by making sure their customer service is impeccable and beyond reproach. You may have heard enough to convince you that there is no need to go any further for all your fitness and supplement needs than here, but there are a few more important features that need to be brought to your attention. The company appreciates their customers and show this through the offering of rewards where you can collect Protein Pounds to put towards your purchases so you can realize some extra savings. The prices are most comparable with lots of promotions always going on to save you money. Checkout is quick and easy and for your convenience there are multiple payment options. In case you are wondering what is popular in the product line you can easily see this upfront. To build your confidence that you have chosen the right place to shop for your fitness and supplement needs just check out the impressive feedback. The list goes on but you will be able to see all of the great attributes of the Body Building Warehouse for yourself. Just remember to set some time aside to do some exploring here as you won’t want to miss anything. You will be most pleased with how easy it is to navigate the site and you are going to feel comfortable with your shopping experiences. Of course you have plenty of other choices of places to shop but why bother when everything you should need or want is in one central location as it is here. It is even more beneficial in knowing that you are do business with true experts who are totally hands on in the fitness supplement world. This is an attribute that is not so easily accessed on the web. There are plenty of suppliers but very few that are on the front line like this company is. You want the best for your body so why not do business with the best! Offer ends August 31st 23:59. Only on orders over Â£50. Ends 31st August 23:59. Offer ends 31st October at midnight. Get 30% off all TANKED products. Save Now at Bodybuilding Warehouse! Spend over £100 on Bodybuilding Warehouse own products and get 40% off! Only valid on orders of Bodybuilding Warehouse own brand products over Â£100. End 31st January at midnight. Only valid on first purchases of Bodybuilding Warehouse own brand products. Ends midnight on 31st January. Offer ends 31st January at midnight.